To those of you who are cruise devotees, forgive me if it seems as though I'm raining on your parade. You see, I'm cruise-ship averse. One reason may be because I get motion sickness at the drop of a hat. Then again, it might also have to do with the fact that the idea of being stuck on a ship in the middle of the ocean kind of freaks me out. And then there's the Norwalk virus. Have you ever seen those news interviews with passengers returning from a Norwalk afflicted cruise?? Talk about a cruise from hell. However, there are certain ships that might entice me to overcome my cruising apprehension. One is the small but luxurious ship upon which Diane Dorrans Saeks recently traveled during her sojourn to Myanmar. (She wrote about it last week.) 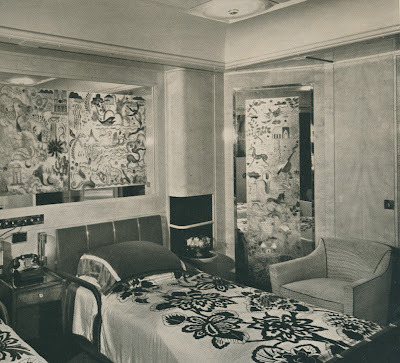 The ship that really strikes my fancy, though, is the late French ocean liner, SS Normandie. I don't wish the ship were around today, because traveling on it would be nothing like it was in the 1930s. There just wouldn't be the same sense of style, gentility, and decorum today as there was back then. 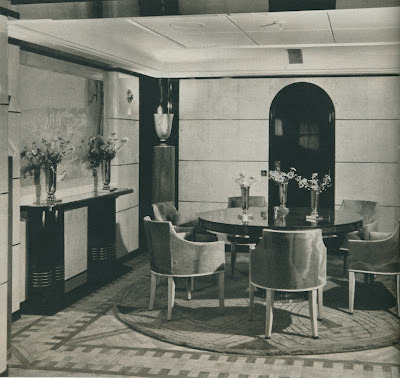 But, for a taste of what might have been (had we lived back then, of course), take a look at the Rouen suite on the Normandie. Decorated by the French firm Dominique, the suite's decor is an example of the Art Deco and Streamline Moderne styles that were used throughout the ship's interiors. It's sad to think that just seven years after these photos were published, the ship was destroyed by fire in the port of New York as it was being converted to a U.S. troopship, having been seized by the U.S. government in World War II. Such a shame, especially considering how beautiful and well-appointed these rooms were. Image at top: The suite's dining room had walls covered in parchment and pallisander. 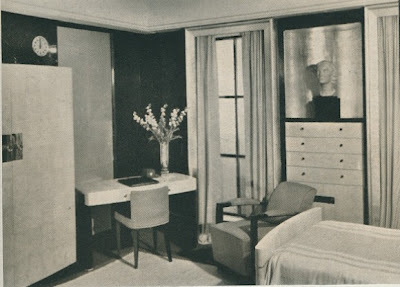 In the bedroom, lacquered blond wood walls had engraved mirrored panels. The color scheme for the room was bisque and brown. The blue bedroom had silk paneled lacquer walls and sharkskin furniture. 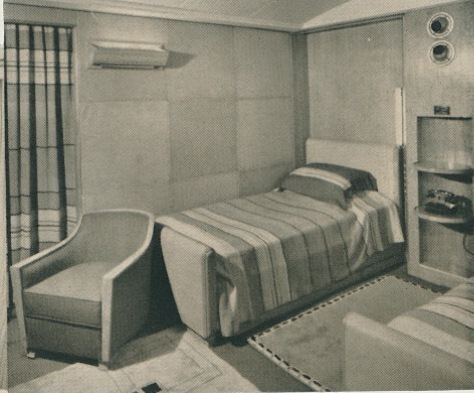 Another bedroom with "laced pigskin...ruddy tones...coarse textures." 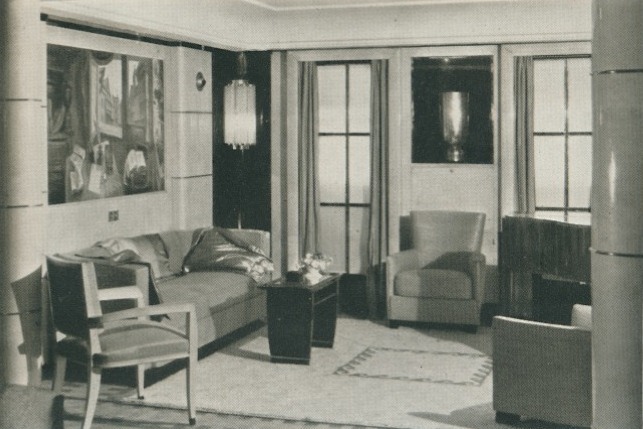 All images from House & Garden, August 1935. It was remarkably thought out in terms of scale and placement. I particularly liked the effect of long windows. Oh my! I can just imagine the likes of Fred and Ginger gliding across the floors. I know I was born in the wrong era! How glorious these sailings must have been!